CENIT AG is represented in Japan with an own sub-sidiary. In terms of content, the Asian subsidiary will focus on software and consulting solutions in the sphere of product lifecycle management. Microscan, a global technology leader in barcode traceability solutions for the packaging industry, announces that it has been awarded a 2011 Ringier Technology Innovation Award in the Packaging Industry category for its two new machine vision products: Vision MINI and Vision HAWK. Bavaria-based Camerobot Systems GmbH has introduced a radical new approach to broadcasting - by bringing state-of-the-art robotics into the studio. Motoman announces MyMotoman remote monitoring for any device that has access to the Internet. MyMotoman monitors robot equipment by sending crucial alerts, current production information and preventive trends via wireless. FlowStone Supports the Ximea Currera-R Machine Vision Camera! This amazing little camera actually has an Intel Atom based PC inside capable of running the whole FlowStone graphical programming language development environment or a compiled FlowStone EXE application. Galil Motion Control, an industry pioneer in motion control technology, is announcing Frequency Analysis Software (FAS) which allows tuning of servo control systems in the frequency domain. FANUC Robotics robots will be out in force at this years PPMA Exhibition being demonstrated by FANUC Robotics UK and also by several of its strategic partners. 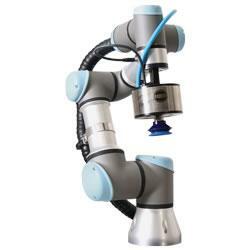 Besides demonstrating the many benefits of FANUC robots for the packaging sector, the underlying theme focuses on affordability. Ford Motor Company is investing $100 million globally to install robotic plant laser inspection technology to improve quality through reduced wind noise and more refined fit and finish. Kinze Manufacturing, Inc. today unveiled an innovative solution to increase productivity on the farm-the Kinze Autonomy Project. The technology, which is the first of its kind in row crop production worldwide, utilizes autonomous agricultural equipment to complete many tasks on the farm with minimal direct human input.